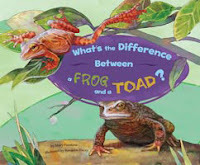 What's the Difference between a Frog and a Toad? by Mary Firestone. Illustrated by Bandelin Dacey. Picture Window Booka/ Capstone Press, 2010. Available now. Well, there I was -- sitting at the pool in 90 degree weather -- every so often jumping in to cool off. Soaking up rays and doing book reviews. Hmmmm, sez I, a frog and toad book would be good for poolside. I'm a sucker for a well-illustrated book and this one meets those standards. Large frogs on the left hand page of a double page spread, which the writer compares to the large toad on the right hand side. Perfect for showing to large groups, if you are in a frog mood. Are there differences between frogs and toads? Aren't they the same kinds of animals? Well some things are the same. Their long sticky tongue is as long as one-third of their body length and they eat similar kinds of bugs. Two pages of back matter: Index, Fun Facts, Glossary, Bibliography of easy readers, plus safe internet sites.